A really big box, full of handy little board books. 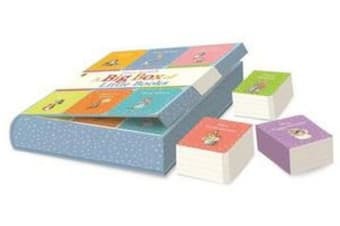 This set includes chunky mini stories all about Peter Rabbit and his friends, including Benjamin Bunny, Squirrel Nutkin, Jemima Puddle-Duck, Jeremy Fisher and Mrs Tiggy-Winkle. Babies and young toddlers will enjoy the stories and pictures, and can play with the chunky little books. Featuring beautiful and classic artwork by Beatrix Potter, this set is a brilliant introduction to her stories about Peter Rabbit and his friends.